Bringing a new cultural dynamic to Hope College since 1988. Your independent film connection and home to many of Hope College’s cultural offerings, including lectures, concerts, art performances and more. April 29 at 7:30 p.m.
May 6 at 7:30 p.m.
May 13–18 at 7:30 p.m.
May 28–June 1 at 7:30 p.m.
June 3–8 at 7:30 p.m.
June 10–15 at 7:30 p.m. 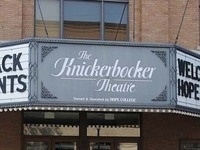 Please contact the Events & Conferences Office to inquire about renting the Knickerbocker Theatre. The Knickerbocker, which translates to "the best in life," has hosted a great number of events since it's grand opening in 1911.